This is another of those “free meals” using leftovers from the Lidl recipe booklet that I’ve written about in the past week. You’ll find the Irish Lasagne and Kedgeree by clicking on their respective names. I confess I’m not a fan of blue cheese. 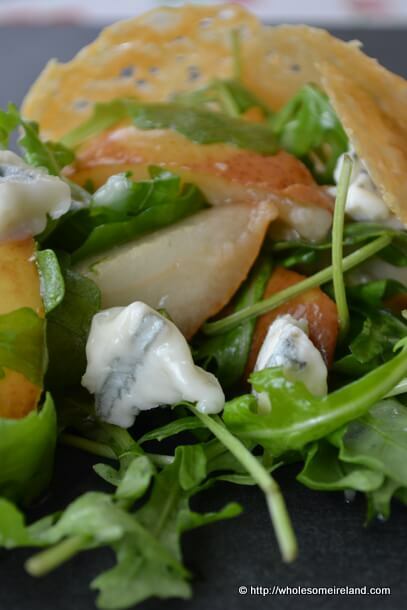 If, like me, you think that blue cheese smells and tastes too much like the contents of a 14 year old’s school bag after 3 months in the back of the wardrobe, then ditch the blue cheese element and use the parmesan only for this warm pear salad. Today I’m off to bake another Birthday cake. There will be a blog post on it later next week, and I promise it will be incredibly easy. Also, I’ve another book review for you in the next week and the final (sweet) recipe from the Lidl leftovers. Whatever you’re up to this weekend, have a great Sunday! Preheat a fan oven to 170 degrees celcius. Slice and core the pears, leaving the skin on. Place the pieces of pear, skin side down onto a lined baking tray. Take a second lined baking tray and using a cookie cutter/ring fill the inside of the ring with a light scattering of grated parmesan, remove the ring. Leave about 4cm space and fill a second ring. Continue until the baking tray has a number of circles of grated cheese. Put both baking trays in the oven and roast for 10 minutes, after which time the pears should be warmed through and the cheese should have melted. Take both trays out the oven and let the cheese cool a little before lifting the “crisps” gently with a knife and resting on kitchen paper to soak up any excess oil. In a large bowl, toss the rocket, olive oil and crumble in the blue cheese. Gently stir through the warm pears and serve immediately with parmesan crisps on the side. Season to taste. Not that I need to remind regular readers at this stage but this post is not sponsored or requested. I simply found an awful lot of left over ingredients in the recipe booklet and decided to share them. This is a frugal dish as it is, coming in at just about 70c per portion if you buy the ingredients in the aforementioned supermarket.